A South West beach cafe and shop operator is celebrating after winning a prestigious business award. The Venus Company, a four-strong chain with three outlets in Devon and one in Cornwall, has won the Queen's Award for Enterprise in Sustainable Development. Founded by husband and wife team Michael and Louisa Smith with Lee Porter in 1995, the business now has a turnover topping the £1m mark. They now serve local and organic produce to over 500,000 people a year. 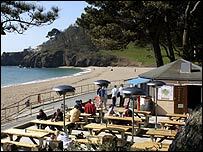 Employing a core group of 15 full-time employees, supplemented by a 30-strong pool of seasonal staff and part time summer catering staff with special needs, the firm has outlets at Blackpool Sands, East Portlemouth and Bigbury on Sea. Last year the company expanded into Cornwall with a £250,000 Venus Cafe and shop at Tolcarne Beach in Newquay. "The Queen's Award is an amazing accolade for a small family firm such as ours and recognises the hard work of everyone," said Michael Smith, managing director. The firm's green approach is evident in all aspect of the operation, from packaging to produce. They have never used polystyrene cups and use chlorine and phosphate-free based products where available. They return cooking oil for recycling, use energy efficient equipment and monitor CO2 emissions. Mr Smith said: "Taking care of the environment is an integral part of our business philosophy. "The royal endorsement supports our mission to be the greenest beach cafe and shop operator in Europe."